You are here: Home / Blogs / Claire’s blog: what’s in a strategy? Organisational strategies are not always the most exciting thing to share and people can be cynical about their value, but I’d really like you to look at our new one and tell me what you think. Don’t worry, it’s small but perfectly formed, it won’t take you long to read. When we published our last three year strategy back in 2015, it generated a bit of a buzz, with a number of other charities telling us they were taking our strategy to their Board of Trustees, as an exemplar of good practice worth replicating. Our funders liked it because the visual nature of it took them straight to the heart of what VHS is about, and my Board and staff team liked it because it gave us a clear narrative to use and build on whenever anyone asked: “What does VHS do?” As Chief Officer I liked it because it nailed down what was distinctive about VHS, set us on a very clear trajectory- and liberated us to say ‘no’ to external demands that didn’t contribute to the strategy. Those of you who know VHS know that we are a very small resource, but over the last three years we have developed a reputation for punching well above our weight. I put that down to a loyal and growing membership, a skilled and passionate staff team, an astute and engaged Board, the support of our funders – and our strategy. The new VHS Strategy 2018 -21 does all the things you expect of a strategy – sets out our over-arching purpose, priorities, outcomes and values in a clear framework for the next three years. 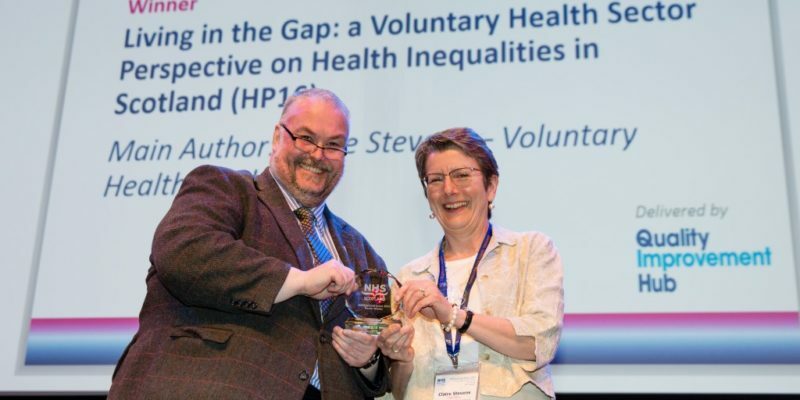 You will see that tackling health inequalities remains core business alongside shining a light on the underlying social and economic determinants of health. You will see a renewed commitment to advancing public health, mental health and health and social care integration, and a new commitment to taking a human rights approach to health. You may not be excited by our strategy, that’s quite understandable, but I am and I’m optimistic that it’s going to help us deliver even more than before. If you want to see a healthier, fairer Scotland served by a thriving voluntary health sector, then we are the network for you, and you are the people we want to work with, so please get in touch.